Stainless steel or enamel pots (with enamel intact) large enough to allow fiber to move freely. These should be reserved for dyeing and not used for food preparation. Aluminum pots will add alum mordant, while copper pots will enhance mordanting with copper and iron pots will contribute iron mordant. Stainless steel and enamel pots with intact enamel are neutral with respect to mordanting. Cooking thermometer, preferably a probe-type candy thermometer, that responds quickly and differentiates widely in the range of 120 to 210 degrees F.
A timer to keep track of time the bath is held at desired temperature. Tongs or chopsticks dedicated to the dyeing process. 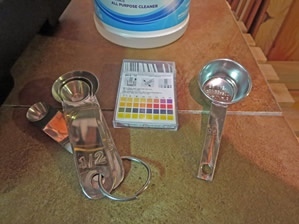 Measuring cups and/or spoons made of non-reactive materials such as glass or stainless steel, also dedicated to the dyeing process, as they will be used to measure mordants. Rubber gloves. The extra tough ones intended for furniture refinishing available at hardware stores work best to insulate hands from hot dye baths. 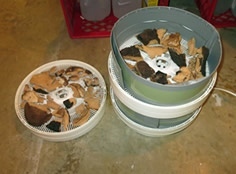 Buckets or bowls (again, not used for food storage or preparation) to hold yarns in dye baths while cooling. pH paper reading from 0 to 14 in gradations of a single unit. Carolina Biological Supply is a good source for these. (See sources in reference list.) EMD Chemicals makes a good paper. A good dense cheesecloth for straining. Loosely woven flour sack towels work also. Wool yarn that has been scoured and possibly mordanted (see below). Colors may vary with the actual variety of yarn. Superwash yarn has had other processing to strip scales from the fibers and absorbs color differently from regular yarn. Sheep’s wool is the most common, but alpaca also dyes well. Consider angora, cashmere and others also. Silk scarves or material or yarn will require more dyestuff per ounce than wool and should have the temperature carefully controlled in order not to be boiled at too high a setting. Cellulose fibers such as cotton or linen can be dyed with mushrooms but will require a great deal more pre-processing and colors will be much more muted. Mordants: The most commonly used mordants are alum and iron (potassium aluminum sulfate and ferrous sulfate). Copper sulfate is also used but is problematical for the environment and few dyers use chrome or tin mordants any more due to their toxicity. Cream of tartar and/or Glauber’s salt help the fiber absorb the mordant more evenly. pH modifiers: Vinegar or citric acid are used to make baths more acid, which normally emphasizes red tones, while ammonia or washing soda are used to make baths more basic, which tends to emphasize blue tones. Scouring agents: Mild soap such as Ivory Snow™ or a mild neutral pH detergent such as Dawn™ original are readily available. Other agents such as Synthropol™, Unicorn™, etc., may be more economical for large quantities of fiber. For most consistent results, distilled water is best. If you like the results from your tap water, use it, but many tap waters contain minerals that may affect your color. (For example, my local tap water seems to have enough iron in it that use of it gives results consistent with mordanting with iron.) Water from dehumidifiers can also be used. Always work in a well-ventilated area, especially while mordanting and dyeing. Wind yarn into skeins. A moderate length of skein is best. Too short a skein will not have enough freedom to dye evenly. Too long a skein is difficult to untangle after scouring, mordanting and dyeing. 24" from one end to the other (i.e. one round measuring 48") seems to work well. 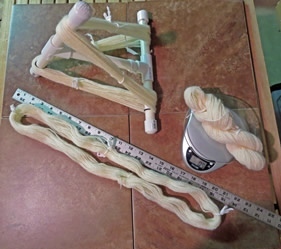 Tie lengths of cotton string in a figure-eight pattern through the strands at four places, tying the string loosely enough that the various solutions of soap, mordants and dye baths can reach all strands everywhere. Wool should be "scoured", by which we do not mean using a scrubbing brush and Comet. To scour wool, soak it in very hot water (140 degrees F or more), without rubbing, twisting or agitating, with a few teaspoons of a mild soap like Ivory Snow or Dawn original detergent for thirty minutes. Then gently remove it from the soap solution, very gently squeeze the soap solution out and immerse it without rubbing, twisting or agitating in very hot clear water. Repeat the removing, gentle squeezing and immersing in hot water until the water remains clear. Avoid extreme temperature changes. The soap loosens the dirt and oil, but the rinsing is what removes them completely from the fiber. Silk usually needs to have any remaining seracin removed by a special bath with a special detergent like Synthrapol. Use the directions on the bottle. While alpaca and similar fibers do not contain lanolin, they may have had oil added in the spinning process, so it is always a good idea to wash them well before mordanting. Rinse all fiber very well. Any soap residue or oils left in the yarn will interfere with both mordanting and dyeing. Once the fiber is clean, you may continue immediately with pre-mordanting or dry it until you can continue to work with it. There are various ways to mordant fiber. Pre-mordanting gives you some flexibility in reusing dye baths and seems to promote light-fastness and color-fastness, but (like post-mordanting) requires that the wool be subjected to high temperatures more than once. It can be done in advance and the wool stored until you have time to do the dyeing. Simultaneous mordanting (mordanting directly in the dye bath) limits you to one mordant per dye bath, but only requires one heating of the wool and is useful if you don’t have time for all the repeated heating, cooling, etc. Post-mordanting (mordanting after dyeing) allows some adjustment of color after the dyeing process, but does also involve multiple exposures to heat. Weigh the wool and calculate the amount of mordant (and additional salts) needed on the basis of the weight of your fiber. Be precise; too much mordant can affect the wool adversely. For example, too much alum will make the wool sticky and cannot be removed after cooking. Iron or copper may actually stain the wool. Soak the fiber in lukewarm water at least one hour. Overnight is good. Take care. Some of these chemicals are poisonous or at best very hard on the skin. Wear rubber gloves and try not to hover over the pot and breathe the fumes. 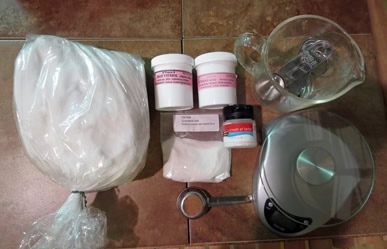 Dissolve the mordant and salts in 1–2 cups of hot water and add to just enough lukewarm water to completely cover the fiber and allow it to “swim” freely. This is especially important with iron mordant, as iron can be hard to deposit evenly into the fiber. Unless you are sure your water contains no minerals that will affect your color, use distilled water. Gently squeeze excess moisture from the fiber and add it to the pot. 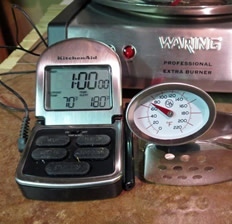 Slowly bring the temperature of the water up to 170 to 180 degrees F and hold it at that temperature for one hour. Move the wool around frequently but gently without agitating in order to encourage an even uptake. Allow the fiber to cool in the mordant solution. Further slight uptake occurs during the cooling process, and leaving it overnight ensures maximum uptake. Remove fiber and squeeze the mordanting solution out. (Remember the rubber gloves.) Rinse the fiber very well in tepid water. Drying it completely before re-wetting for the dye bath improves the color-fastness and light-fastness. Procedures for simultaneous and post-mordanting can be found in the books listed on the References and Sources page. Mordanting silk, by the way, requires a different proportion and a much gentler procedure. I have not pre-mordanted silk with anything but alum, although I have mordanted silk in the bath with iron. I have not had the silk scarf treated that way long enough to know whether that procedure damaged the silk or not, but I have seen pictures on the internet of damage to cottons resulting from the use of an iron mordant. I do not know how much time that damage took to show up, however. Mordanting other protein fibers such as alpaca seems to be very much like mordanting wool. 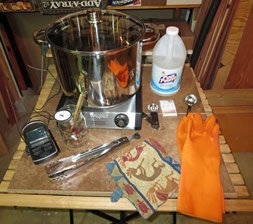 Unlike the more common dyeing with chemical dyes or dyeing with some natural materials, you must prepare your own dye bath from the mushrooms before adding the wool. The mushrooms should be dried after identification in order to ensure as uniform as possible a ratio by weight of dried material to fiber. The starting point is one ounce of dried mushroom to one ounce of wool. (Other fibers may require a different ratio.) Some polypores and toothed fungi require nearly twice as much, while some very strong dyers such as Cortinarius semisanguineus or Hapalopilus nidulans require quite a lot less. Unless otherwise stated, a 1:1 ratio is used. Crush, break up, even pound or grate, the dried mushrooms into very small pieces, in general as small as possible. Soak in room temperature water (preferably distilled) at least one hour but preferably overnight. A plastic pail or container may be used for this. Add more water and place in cooking pot. (Distilled water is best, but soft water may be used if it has no salts.) Use enough water to allow the bits of mushroom to float freely without being crowded in the water. Bring to 170–180°F and "cook" for one hour. Some mushrooms require pH modification to yield their dye material best. All polypores except Phaeolus schweinitzii and all toothed fungi and their near relatives need to have the pH of the bath adjusted after ten minutes of cooking. For these, the pH should be brought up to 9 by adding plain ammonia (no lemon, no perfumes, no soap) or washing soda. Use a good pH paper to test until the pH is at 9. Remember that you will need to adjust it again once the dye bath is augmented by more water and again when the yarn is added. It is preferable to soak the wool in lukewarm water at least one hour. If the wool is wet, the temperature of the wool when added to the dye bath should be the same as the dye bath. Dry wool may be added carefully to a hot bath without danger of felting. Add enough water to allow the wool plenty of freedom in the pot, but not so much that the wool can’t reach all of the dye stuff in the bath. If the pH was adjusted in the cooking of the bath, check and readjust the pH to the same level and in the same way as the bath preparation after adding the water and/or after adding wool. Bring bath and wool slowly up to 170–180 degrees F and hold for one hour. Move wool around several times during this cooking, but do not stir or agitate. Silk should be dyed at a lower temperature and some mushrooms such as the toothed fungi lose their color at temperatures above 170°. Even if you like a shade of the color obtained partway through the cooking, the heat must be maintained for the full hour. 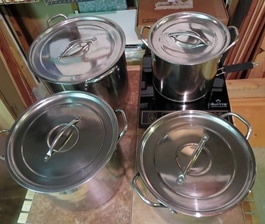 If you think you will want to stop the absorbing of the dye early, have a separate pot of hot (distilled) water ready at the same temperature so that you can transfer the partially dyed yarn to the plain water to finish its heat setting. If possible, allow the yarn to cool in the dye bath, preferably overnight. The longer the wool can cool in the dye bath, the more uptake and light-fastness you will achieve. Once the yarn is cool, remove from the dye bath, gently squeezing out the excess bath for possible later baths, and rinse well in room temperature water. Squeeze out the excess water and then either spin it on your wrist (outside) or roll in an old terrycloth towel to remove more moisture. Hang out to dry away from direct sunlight. While dyeing, prepare a label with information about the yarn, mushroom, ratio of mushroom to wool, mordant and bath number/procedure/pH and other relevant information. Keep this with the yarn and attach it to the skein when the yarn is dry. When I skein off wool to start the process, I start a label that will be added to as I go along. I first put the type of wool (e.g., Henry’s Attic Crown Colony, Kramer’s Eileen, etc. ), the weight of the skein and the approximate yardage. This helps me to plan later. When I mordant, I add the mordant to each label. The mordant doesn’t add much in weight, so by re-weighing after dyeing, I can identify which label belongs to which skein. One possibility is to make your labels from a rectangle of Tyvek, which you can cut from Tyvek envelopes (available at office supply stores or from the post office–free if you don’t confess that you are re-purposing the post office supplies). These can be written on with permanent markers such as Sharpie pens and left on the skeins in the various baths. When you start a bath, it is a good idea to take a length of plastic marker tape and write the name of the mushroom on it. Tie that to the soaking pot and then as the dye bath moves from soaking to pot to straining, back to pot and then to bucket and possibly back to pot for subsequent baths, the label can go with it to keep it identified. You can mark on the tape how many baths it has provided in order to maintain an idea of how much dye stuff it has left. You can also mark what mordants have been used so far, as a tiny amount of the mordant does leach into the bath from the yarn being dyed, and if you’ve mordanted in the bath, you definitely want to remember that. A large square of Tyvek and string can also be used for the same purpose. Type of yarn, weight and yardage plus the mordant used. Ratio of mushroom to wool. Time at temperature in dye bath if not the full time and any special procedures used (such as removing early and cooking off in plain water). Temperature of dye bath if not the usual 170° to 180°F. Any modifications of pH made in cooking the dye bath and in poaching the yarn. How much ammonia, vinegar, washing soda, citric acid, etc. was added can be useful information in the future. Number of bath: "First bath", "First afterbath" or "Second bath", etc. Any other special information that you may want to know later if you decide you love this particular result. It is also a good idea to keep samples of your dyed yarn with a record of how you achieved that particular result. One day you may want to know just how a particular color was achieved on a particular yarn. There are various ways of doing this. 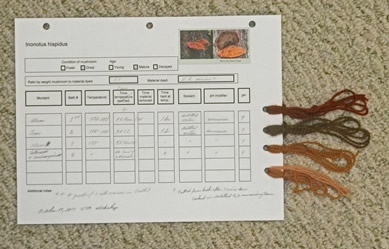 For example, you can keep a notebook with samples taped to sheets that record your procedure, ratios, age and state of mushroom(s), etc. One handy way to keep track is a card with a table for one session recording the various baths, temperatures, pH modification, etc. and holes on one side to tie a sample of each result. These can then be put in a loose-leaf notebook or a file for future reference.